Vegetable garden June 3, I wish it were further along. This spring, I have finally, at my advanced aged and with all my gardening experience, decided on the best tomato stakes for my garden. I am, of course, a fervent staker of tomatoes, having learned how to grow tomatoes from my father, who was also a tomato staker. It was all I knew, and all I cared to know about growing tomatoes. Stake them. Don't cage them. When I decided that I had finally figured out the best tomato stakes for me, I recalled that when my Dad was about the age I am now, he, too, found the perfect stakes for his tomatoes. He used heavy duty 'T' fence posts. He sank those fence posts a good 18 inches into the ground and attached cross bars between them. There was no tomato plant that was ever going to grow so large that it would pull those posts down. It was a permanent structure. 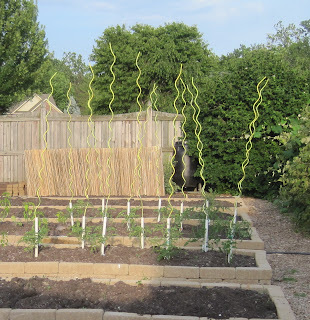 In my own garden, I have opted to not put in a permanent structure for staking my tomatoes because I like to rotate my tomatoes around the garden, planting them in different locations each year, to foil those pesky plant diseases and other pests. Though, no matter where I plant my tomatoes, the tomato hornworms find them. Instead, I pound two foot lengths of 1" PVC pipe about a foot into the ground and then drop a stake into those pipes. Over the years, I've tried several stakes, including those vinyl coated metal stakes. Last year, I bought a new set of them and by August, several of the stakes had been pulled over by the weight of the tomato plants. The only stakes that lasted and never bent were four metal spiral stakes I purchased about twenty years ago. 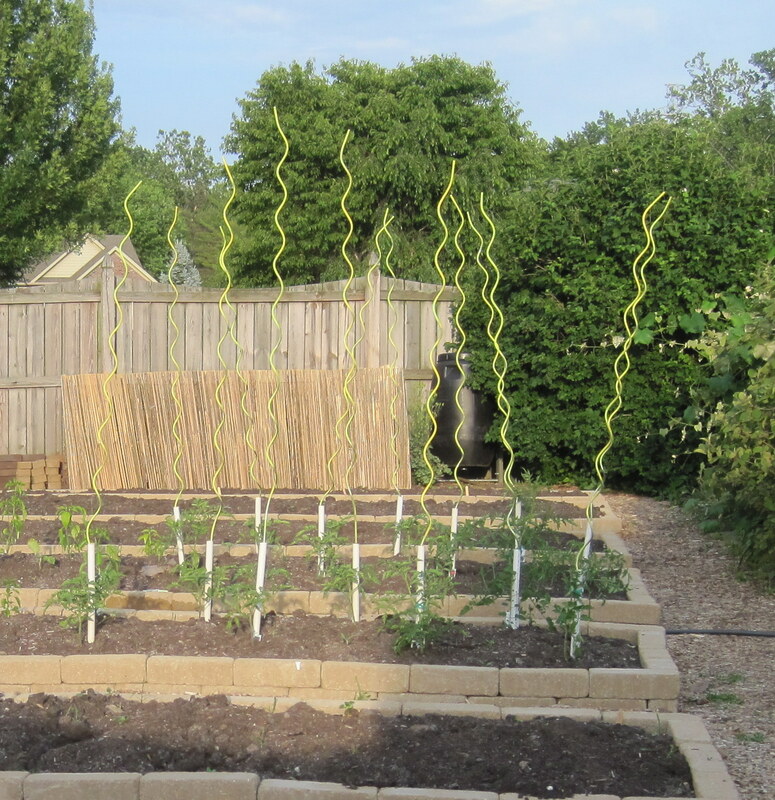 Year in and year out, those spiral stakes have held up, no matter how big the tomato plants are. Yet, I hesitated for several years about buying more of them because they aren't cheap. But then I figured out the cost of all the stakes I've purchased and discarded and decided to put a crow bar in my wallet and buy ten more spiral stakes. Today, I set them up in the yard and painted them lime green with accents of bright yellow because I had some spray paint in those colors left over from another project. Before, they were all shiny and metal, except the old ones, which were more of a rusty brown. Afterward, they were bright and garden-y colored. Out in the garden, I think they look almost sculptural. I think next year, I'll paint that PVC pipe a lovely green, too. I got some of those spiral stakes to try this year. I didn't think of the PVC-pipe method, though, and was stymied about how to put them in the ground when I can't pound on the ends! This is a great idea. Carol, those stakes are very cool looking! I have been using old metal broom handles. They're white and they work just fine. Interesting, Can't wait to see how they look when the tomatoes are full grown. I got stuck at pounding the PVC pipe a foot into the ground.I don't think that would happen in my rocky clay. It would turn into an excavation project. Better to just pound the tomato stake into the ground. Hope you have a wonderful tomato crop. They do look sculptural...very nice!! Very nice! I use marigolds around my tomatoes and never have horn worms. Looks pretty too. Wont the tomato plant want to tip over from the weight of the plant? I guess I just don't understand how the stake keeps things upright. Love the look of the spiral stakes regardless though. These could be fun painted bright colors and just situated throughout the garden for no real reason too. I like the bright color you painted them. I guess the spiral stakes require you assisting the plant to coil around and anchoring of said plant. I love that color, and they will look cool even without tomato vines. Do you leave them out in the winter? You could arrange them artistically so they really do look like sculpture. I love your stakes! Painting them a bright green was a neat idea!! I have to confess, I'm a "cager", and I've gone through a similar process to find the perfect cage LOL. 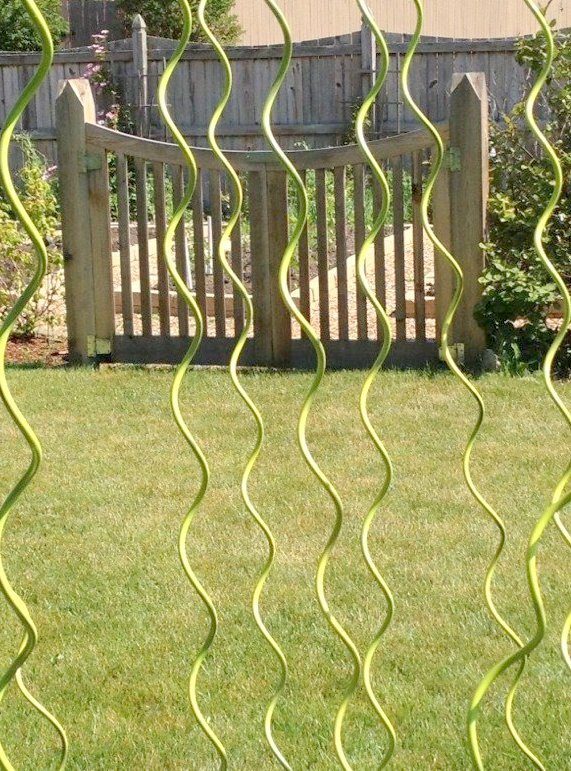 The stakes are cool and so is your garden gate! I have used those and they are quite sculptural. I have found they are not quite sturdy enough for indeterminate tomatoes. I many have to show you the ones the EM made. Yours do complete the garden though and the green is so you! Fantastic idea! So are these the ones you can buy that come in red now? If not, where did you buy the non-coated, not painted ones and are they thicker than the ones that are coated? My tomatoes were such a mess last year I had two spiral stakes per plant and it was stll pretty dicey by the end of the season. Those are very formal stakes, but of course definitely lovely. In this part of the world where these things are so costly for our meager resources, I just cut bamboos from the nearby growths or old small tree dried branches and put it between the tomatoes. Tomatoes find it convenient too, and they are also happy, hahaha! 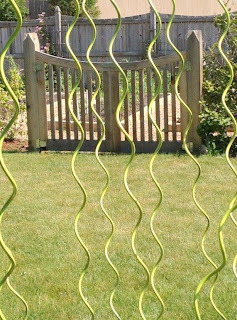 The stakes do look cool, Carol - hope this latest kind of garden sculpture works for you. May you have many tomatoes! 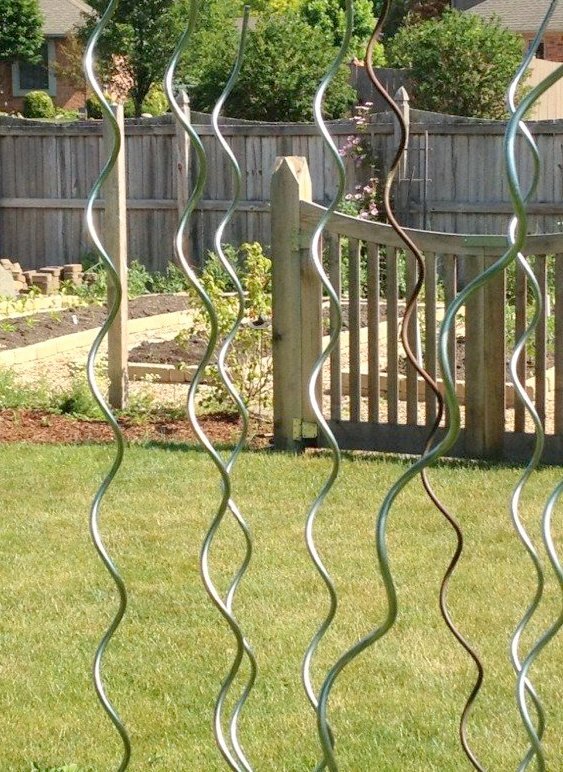 Wherever did you find such long spirals? The 4' ones I ordered some time ago can't handle indeterminates... These look fantastic! I hate my beat up cages too. 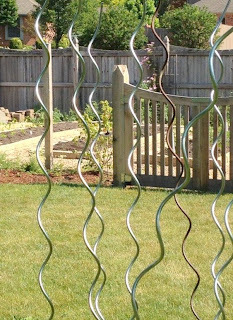 These are so cool, Carol--they look like garden art, not something as useful as tomato stakes. I'm still a tomato cage gal, but I also discovered last year that it was worth it to "put a crowbar into my wallet" :) and invest in some heavy-duty ones instead of the flimsy ones I'd been using for years. Those look so cool! 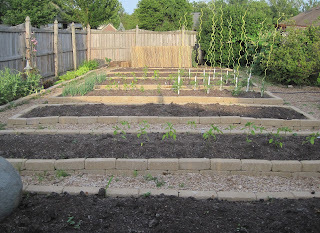 I'm still trying to decide stakes vs. cages, especially since my tomatoes are in the middle of my garden beds... so whatever I use ought to look good! I love spiral stakes. They work terrific when one prunes their plants to a single stalk and yield don't suffer. I love my spiral tomato stakes. They work terrific with pruned plants and the yeild is great--just have to be dilligent with the pruning.